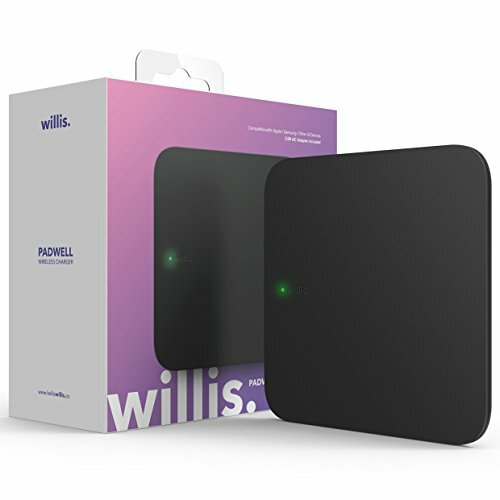 Meet Padwell, Willis' Wireless Charger. Your new best friend for your smart phone. No need to buy separate wireless chargers for different phone types. Guaranteed maximum power output for each device. Padwell keeps your phone from overheating with our over-circuit and over-surge protection. Padwell's overheat protection technology will stop charging your phone once the battery reaches 100% while still maintaining the phone at full charge until you are ready to use your smartphone again. Padwell customized wall adapter (included in the package) ensures that the maximum power delivery is consistently transferred to Padwell so that you can charge faster. 1. Due to the nature of wireless charging, your phone will not charge when there are accessories (see below) between the charging pad and your phone. To ensure functionality, please remove any of these accessories prior to charging. Fast & Convenient Charge: Simply place your device on top of Willis Padwell for fast and convenient wireless charging. LED indicator lights up to indicate that the wireless device is charging properly and will remain lighted until the device is 100% charged. Qi Compatibility: Designed for all Qi-compatible devices including iPhone 8 / 8+, X (7.5W) / Samsung Galaxy S9 / S9+, S8 / S8+, S7 / S7 Edge, S6 / S6 Edge, Note 8, Note 5 (10W) / Other Qi-enabled devices (5W). No need to purchase a separate wireless charger for Samsung and Apple iPhones. Certified Safety: Advanced safety feature provides over-charge temperature control, surge protection, short-circuit prevention, and more to ensure safety. Totally eliminate radiation and overheating risks associated with wireless charging to fully protect both you and your smartphone. If you have any questions about this product by Willis, contact us by completing and submitting the form below. If you are looking for a specif part number, please include it with your message.